There are many wading birds in the Florida Keys. These are just a few. This is a very large bird with wing spans 5 to 6 feet. When feeding, it will usually keep its head down and slowly walks forward. 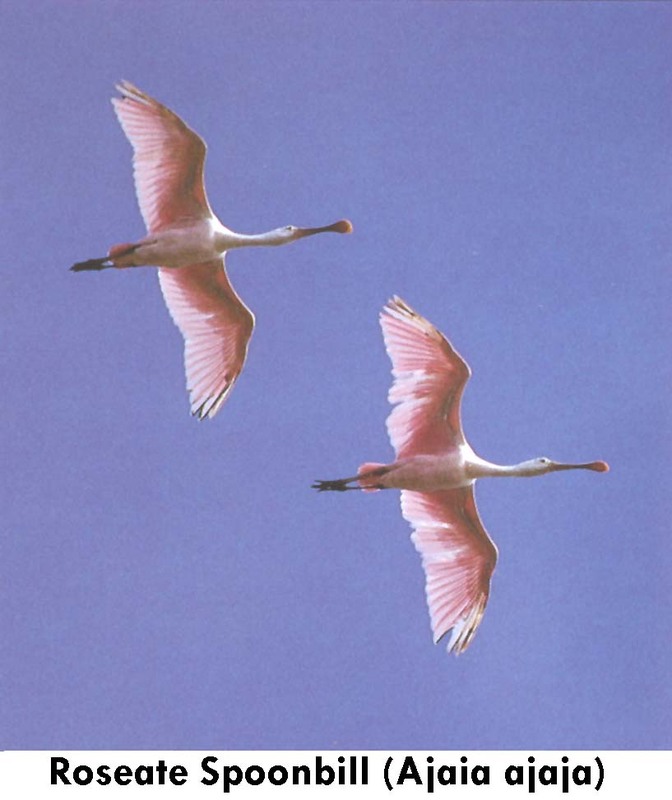 It is graceful in flight and will often soar very high on thermals. The Spoonbill is often mistaken for the Flamingo of another family. 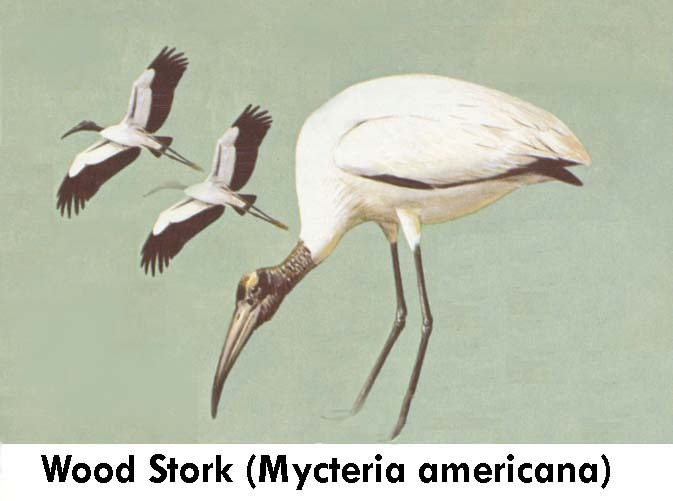 Its back and neck are almost white, but the give away is its flat, spoonlike bill. When feeding it sweeps its bill laterally from side to side. 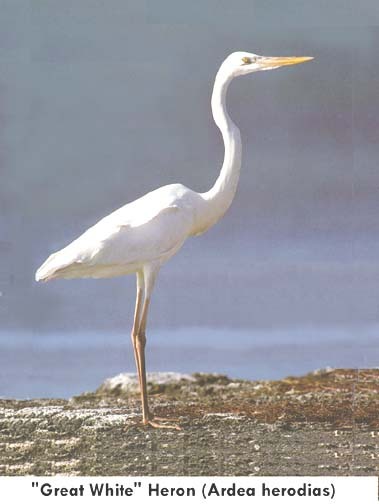 This is a very tall bird, Florida's largest white heron and restricted in its range. It is easily distinguished from the egret by its yellow bill and yellowish legs. The Great Egret also has a yellowish bill though, but blackish legs. The Osprey is Florida's only raptor that plunges feet first into the water to grab its food. It is often mistaken for the Bald Eagle because of its white head, especially when only its head is seen in the nest. 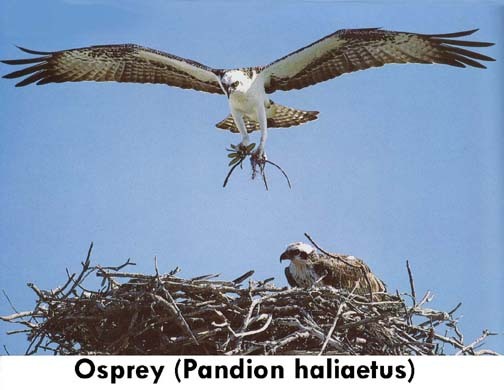 Note the tail of the Osprey is not white, but its breast is. It is also about 2/3rds as large as the Bald Eagle. The female is noticeable larger when seen side by side. 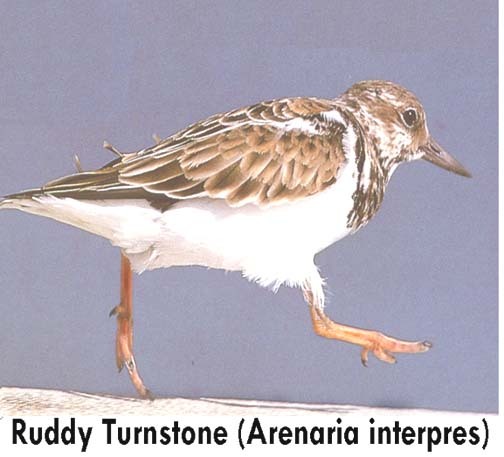 Shown here running, the Ruddy Turnstone here appears not to be squat and robust as he actually is. Their legs are quite reddish and the collar almost black at times. He is usually found along rocky shorelines. A Field Guide to the Birds - Roger Peterson - 1980, Houghton, Mifflin Co.